(VANCOUVER) The Golden Butterfly Effect started as a ripple on the shores of Stanley Park’s Klahowya Village today and spread its wings all the way to the Cariboo. The Chasing the Golden Butterfly geocache/passport program kicked off its 2010 season on Wednesday with a series of events that ranged from Vancouver on the Coast to Barkerville in the Interior. The event in Klahowya Village featured a count-down to launch the two new geocaches secreted away on the exhibition grounds and a performance by the Git Hayetsk dancers, a Vancouver-based troupe that includes dancers from many different nations, including Nisga’a, Tsimshian, Gitxsan, Haida, Tlingit and Haisla. Klahowya Village is an exhibition staged by Aboriginal Tourism B.C. and was one of several sites that had new geocaches activated on July 14. Geocaching is a hi-tech treasure-hunting pastime that uses a Global Positioning System (GPS) device. Played all over the world, geocaching is a great way to explore B.C.’s historic sites and heritage trails. Similar events were held in Hope and Barkerville, Virtual events were held in Princeton and in Gold Country, centred in Cache Creek. In Hope, a volunteer team of about 20 from the Hope Mountain Centre combined the geocache launch with a work bee to put the finishing touches on the Peers Creek trailhead, the western entrance to the historic Hudson’s Bay Company (1849) Heritage Trail. The trail is part of the New Pathways to Gold Society’s Heritage Trails program. 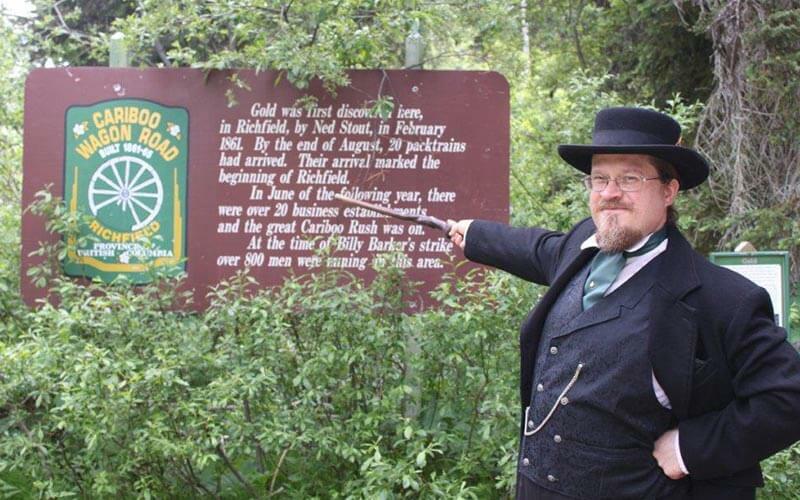 In Barkerville, Judge Matthew Baillie Begbie presided over the launch of three caches along the historic Cariboo Waggon Road. The caches at Barkerville, Wells and Stanley each contain a vial of 24-carat leaf gold as a special prize for the first geocachers to find them. “Don’t hang about get out there and chase those golden butterflies,” said Begbie in laying down the law to hopeful geocachers. A heritage initiative coordinated by the New Pathways to Gold Society (NPTGS), Chasing the Golden Butterfly combines a traditional passport program like the one used during Expo 86 with the geocaching to encourage travelers to visit historic sites in B.C. Chasing the Golden Butterfly is supported by a partnership between the New Pathways to Gold Society, BC150, GCCS, ATBC, Vancouver Coast and Mountain Tourism Association, Cariboo Coast Chilcotin Tourism Association, B.C. Transmission Corporation and community sponsors.